Vaguely titled, Captain Carey, U.S.A. (1949) is not the Cold War flag-waver its moniker suggests, nor quite the noir suggested by the cover art, or the war movie the poster implies, but rather a brooding thriller of postwar angst set in the Italian Alps near Milan. Alan Ladd stars as a former O.S.S. man determine to locate and kill the person who betrayed him to the Nazis. Produced by future prolific 007 screenwriter Richard Maibaum and directed by Mitchell Leisen, the picture gets off to an exciting start, and then becomes intriguing for its unusual portrait of postwar Italy and Ladd's less than triumphant return there. There's an unexpected surprise but then the film gradually loses interest, though it builds to a fairly tense climax at the end. It also boasts an offbeat, interesting cast, several incredible soundstage sets and, interestingly enough, it introduces one of pop music's most iconic songs. Sublicensed to Olive Films, this Paramount production, in full-frame and black-and-white, looks a bit washed-out and not all that impressive, but it's still noticeably superior to standard definition. No extras. The story opens in 1944, where OSS officers Capt. Web Carey (Ladd) and Frank (Paul Lees) are based in the cellar of a beautiful but isolated island palazzo, aided by Web's Italian lover, Giulia de Cresci (Wanda Hendrix; Web calls her "Julie" throughout). In the cellar the men discover a hidden room undisturbed for 200 years, supposedly containing hidden family treasures, including a painting of a the palazzo itself. Web and Frank are in the midst of transmitting data about troop dispatches when Nazis suddenly swarm the island. Frank is shot dead, Web has an apparently fatal head wound, and an overcome Giulia is dragged into an adjacent room and apparently executed on the spot. In New York four years later, Web, who miraculously survived, is astounded to find the painting of the palazzo on display at an art gallery. The owner (Thomas Browne Henry) boasts of refusing a $30,000 offer for its purchase. Web learns the heretofore-lost painting was smuggled out of Switzerland, suggesting the smuggler and the person who betrayed him to the Nazis must be one and the same. Abandoning his fiancée, Web heads back to Italy determined to avenge Giulia's murder. The former partisans, however, don't exactly greet Web with open arms. They blame him for the death of 28 locals murdered by the Nazis in reprisals. Further, former collaborator Luigi (Frank Puglia) also resents Web for the death of his son, Mario, beaten to death, his body hanged and left to rot when the partisans falsely accused him of being the traitor. At the palazzo, Giulia's aristocratic grandmother, Countess Francesca de Cresci (Celia Lovsky), and her family deny any knowledge of the painting or other treasures from the hidden room being smuggled out of Italy. After Web's capture, members of the family were shipped off to a concentration camp, though as aristocrats apparently they received special treatment. 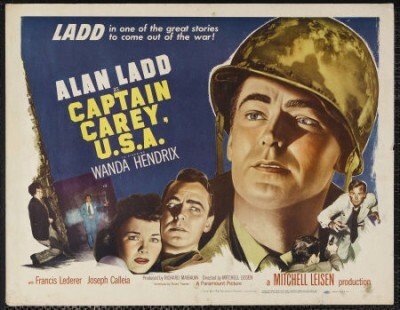 Captain Carey, U.S.A., adapted from Martha Albrand's novel No Surrender, is a real curious picture. While containing war movie and noir elements (including a nod of sorts to Laura), the picture is most interesting in its depiction of early postwar Italy, and its citizenry's uneasy relationship to its American title character. The film gradually becomes more conventional but the wartime scenes are impressively suspenseful and, for the time, quite violent. It was the first non-musical film to introduce an Oscar-winning Best Song: the "Mona Lisa," popularized that same year by Nat King Cole and which the partisans play to signal the Americans of approaching Nazis. The song is greatly overused in the movie, to the point where even Web growls to one blind accordionist, "Tell him to stop. It's getting on my nerves!" Jacksonville-born Hendrix makes a surprisingly credible Italian aristocrat*, and the good supporting cast includes Francis Lederer, Joseph Calleia, Angela Clarke, Roland Winters and, in an early role, Russ Tamblyn. It's doubtful one frame of Captain Carey, U.S.A. was shot in Italy, but the filmmakers, aided by several good matte paintings, extravagantly recreate the northern Italian village. In particular is a positively massive piazza set, perhaps 40 feet high, filmed on a vast soundstage. Captain Carey, U.S.A. looks a bit washed out and blah to this reviewer's eyes, with weaker blacks and more speckling and other wear than I was expecting, especially given Olive Films' and Paramount's strong track record with these catalog Blu-ray releases. It's still okay and definitely a couple of notches ahead of a good SD transfer - one can see more detail here, clearly - but it's not the knockout I was hoping for. The mono audio (English only, no subtitles) is fine. No Extra Features. Offbeat and interesting, Captain Carey, U.S.A. is Recommended. * She reprised her role in a radio adaptation starring Charlton Heston as Web.